We've got a doberman with a hard-to-diagnose skin issue. Usually starts with a cyst/furuncle of some kind and EXPLODES into a bad skin infection that takes months to heal. The word we're using to describe her condition now is "cellulitis" or our current vet mentioned "vasculitis," but that doesn't answer HOW this all starts. 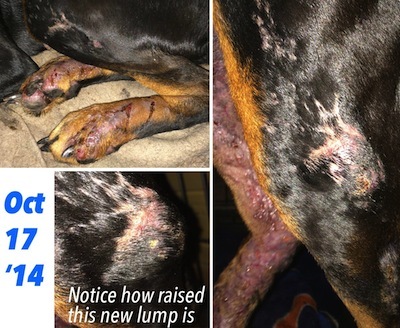 She has been to 4 different veterinary offices in Illinois and Wisconsin and seen a total of 12 different vets concerning this recurring issue. Haven't yet taken her to a dermatologist as there isn't one within 200 miles of us but I feel like that future appointment is almost inevitable. She's had an annual recurring skin problem since Sept. 2012 (even a small, quick to resolve occurrence in Aug. 2011) - starts with a small bump/cyst/lump/furuncle and then morphs into an out-of-control infection that lasts for several months. Usually she eventually gets better, but this year, it will be 6 months at Thanksgiving that she's been struggling with this year's blow-up. She has been crate-bound since early August. 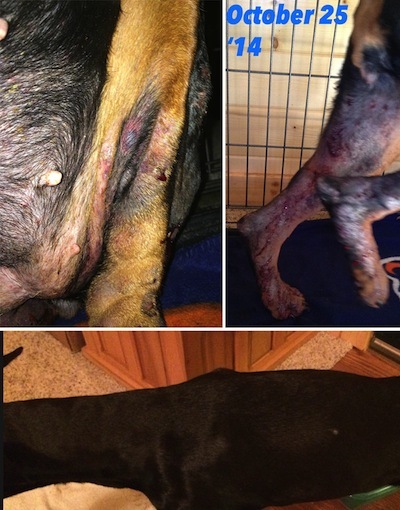 Her two rear feet and 'shins' are swollen, bleeding and oozing constantly. When she lays down to rest, it seems that clotting starts to happen (good), but the skin in those areas is so brittle, shiny, and thin-looking from the infection/disease/affliction that when she stands up, the skin bursts open and there's just blood oozing everywhere (bad). History: Year 1 flare-up started with an interdigital cyst between the front paw toes (not pads). Started in September and cleared up in Dec./Jan. Year 2 started April 8, 2013 on her rear left hock/upper thigh and spread down that leg and all the way up to beneath her tail. Cleared up some time in Aug/Sept. but still has scarring at the origin point (white, dry, hard skin where hair does not grow). Year 3 started June 2014 as an interdigital cyst between the right rear toes and has grown to 'infect' the other foot. It has gotten to a point where she holds her right rear foot up in the air and only walks using three legs. The swelling/edema was really bad and the only thing that helps the swelling is steroids (has helped all three occurrences). This year she's also got a bad rash that's appeared in her armpits and abdominal area. Most vets have treated only the symptoms and didn't even attempt to figure out the cause. That means most of the time the diagnoses and prescription were: infection=antibiotics, steroid shot, steroid pills, betadine soaks, ointments, sprays, and painkillers. This is the year we really got sick of it and said, "Look, this seems to be occurring EVERY year. Can we please figure out what it is so we can help prevent or control it?" One of the more recent vets, after 3.5 months of Sofie making weekly or bi-weekly office visits for steroid and antibiotic refills finally gave up and said, "I can't help this dog." At that point (late August of this year), we started to do our own veterinary/clinical online research since we felt like no normal vets could help Sofie. We found that there are blood tests, biopsies, and other lab diagnostics that can be done to help determine a cause (I cannot believe no previous vet had even mentioned this or thought to do this....). We felt that her affliction could be a number of different things, most of which can be further investigated through testing. Our newest vet, a skin specialist but not a dermatologist, saw Sofie's awful, bloody condition and could probably see the frustration on our faces and immediately did an on-site blood panel and same-day biopsy surgery on three different sites (two bad spots, one normal skin spot). He said that thyroid came back low but could be due to Sofie's body fighting off this ongoing infection, she had a BUN of 7 (kind of low) and has monocytosis. She has not had a full thyroid panel (not sure how it's different from a regular blood test; should we request one?). Biopsy lab results came in about 5 days later and note "deep bacterial infection is suspected," "suspected vasculitus, and deep necrosis." No mention of autoimmune diseases in biopsy report. Skin scrapings have all come back negative. Cytology slide examinations are now showing that the previous bacterial infection has cleared up, however Sofie is just not getting better - she's not healing. Next Thursday (Oct. 30) we're taking her in to have blood drawn to do a serum/blood allergy test at the same new vet that did the blood testing. From my understanding, an intradermal test would require 1) her to be off steroids (currently on dexamethasone pills) and 2) a dermatologist facility. That's why we're opting for a serum test instead, although I do understand that I.D. test tends to be more accurate. Can't imagine her being off steroids for long enough to have one done. She is a HUGE pill-spitter-outter so we need to crush her pills and mix them with something. Currently that's plain non-fat Land o' Lakes yogurt and hard boiled eggs. I realize that we're adding food to a LID, but it's either that or she doesn't get her meds I'm open for any creative ideas on how to get a pill-hating dog to eat pills on a LID. It was recommended by a fellow doberman owner to stop the eggs and switch to canned pumpkin as pumpkin is an ingredient in the Acana food and eggs are not. My other big concern is that if there's no current bacterial infection, why is she still bleeding? Why can't she just clot and get better? FYI, her parentage (VetGen DNA test results) shows her mother was vWD clear and her father was vWD carrier. We've not had her vWD tested as the breeder assured us she was fine - should we test her? 6) And some kind of blood clotting issue in addition to all this. Maybe vasculitis or cellulitus would fall under this option. It's also our feeling that Sofie's affliction might be caused by not just ONE thing but a mix of things (ex: hypothyroid with an allergy to fish-related ingredients and hair follicle problems). Have you ever heard of anything like this? What other steps could we take to try and help her while we wait for blood allergy testing results? What other tests SHOULD be performed by a vet (a valid question since it seems like most vets are stumped by skin issues)? 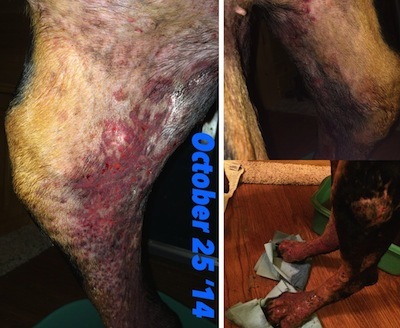 Is there anything we can do - sprays or supplements - that can help her dry, brittle, bleeding feet start healing? Also open for any skin specialist doctors in my area that'd be willing to talk on the phone via a phone consultation. I want to discuss Sofie's history with any future potential specialist/dermatologist before we take a day or two off work to bring her to a far away treatment center (we live in north central WI about 1.5 hours south of Lake Superior - 3.5 hrs from Minneapolis and 4 hours from Madison). Our new vet seems like he cares very much but we realize he's not a certified dermatologist. After our bad experience with vets, we'd really want to consult with them on the phone before we make a special road trip for them. Aurora, IL is also a second option as we have family that live in the Chicago suburbs. Either way, we'd need to take time off work to get her to a dermatologist. I'm attaching some progression photos of Sofie's 2014 issue. I do not have any pics from the very onset from "day 1" in early June. When we first noticed it, it was just a small pink lump in between her toes. In hindsight, I wish we would have taken some photos! As you'll see, it's gotten progressively worse. Sofie and us thank you for any suggestions or advice you can give. She really wants to get better! You have described this condition and the attempted treatments extremely well. How frustrating for both you and your dog! 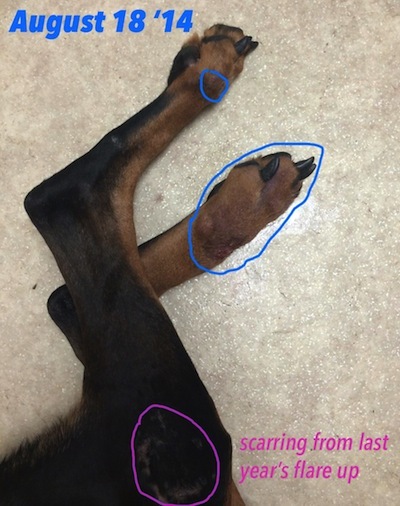 Skin issues can be some of the most difficult things to deal with in veterinary medicine and yes, I have had some cases like this that were very frustrating. In some we were able to eventually find either a cure or ways to manage the problem. But I do have to admit that I have had the odd case where we could find a solution that worked. Most of those though were because of owners' financial limitations. I really do believe that every skin case has a cure, but the problem is that often multiple expensive tests are needed in order to find that solution. By far the best advice that I can give you is to find a way to see a veterinary dermatologist. This is an extremely complicated case and this really would be your best bet when it comes to finding a solution. It is good that you had biopsies done. And I can understand the frustration of just being told that there is infection present. I think that the "suspected vasulitis" part is important as this is not normal. Vasculitis actually is an autoimmune condition. It's a very uncommon condition where blood vessels get inflamed and the immune system attacks them. The problem is, though, that it is often difficult to figure out why this is happening. sometimes vasculitis can happen as a result of a reaction to a drug, or an allergy, but it can also be because of rare conditions like lupus, or several types of tick borne diseases. It can be because of food allergies. Or, it can actually be because a dog is reacting to the type of bacteria that often causes infections - staphylococcus. We generally try to test for what we can and rule out what we can. But, in some cases vasculitis can even be what we call "idiopathic" meaning that there is no known cause. The treatment for vasculitis is twofold. First, stop the cause (which can be a problem if you don't know the cause.) And secondly, stop the immune system from overreacting like this. This usually means using autoimmune drugs. Sometimes steroids will work (like prednisone or dexamathasone) but in many cases other drugs are needed. There are several that have been tried successfully including pentoxifylline, cyclophosphamide, azathioprine and others. Sadly, these drugs can often be quite expensive. There is some belief that Vitamin E can help as well although it wouldn't be a miracle cure on its own. So, now, let's answer some of your questions. The question about the thyroid is tough to answer. I don't usually base treatment on just a T4 test. I like to do additional tests to make sure that the thyroid is not just being suppressed by infection. But, if your vet feels strongly that thyroid is a possible culprit, then there's no harm in going on medication provided that the blood level is checked from time to time to make sure that we're not giving too much. Regarding the pills...I don't think I can add much to what you're already doing. If pumpkin works, that's a good idea. Why is she still bleeding? I would guess that this is the vasculitis which is causing her blood vessels to be fragile. I really think that this is her main problem. Sure, the vasculitis did not cause the infection. But, let's say she had a mild seasonal allergy which is common at this time of year. While most dogs might get some itchiness or possibly a mild skin infection, when her skin starts to get inflamed, the vasculitis kicks in and makes it infinitely worse. So, while it's important to try to find and treat the initial cause, I think you may find that keeping on top of the vasculitis is vitally important as well. There is a decent chance that this is an immune system problem that she will always have. The good news is that once your vets figure out what works well to control it, then she can stay on this medicine long term. That way, when she does deal with allergies (or whatever) in the future, it will not be nearly as bad. This is another good reason to see a dermatologist. They see the rarest of the rare cases and will be the most up to date on what drugs seem to be the most effective. 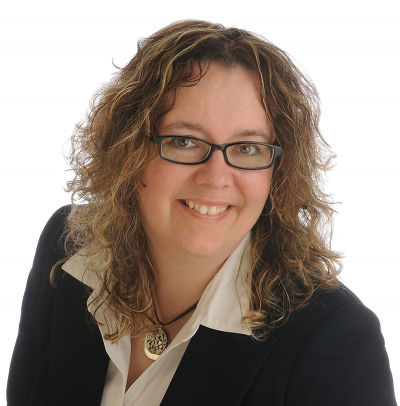 Should she be tested for vWD? I would not at this point. I think the bleeding can be explained by the vasculitis. As you likely know, there is not likely to be a quick fix or even a permanent fix for these problems. But, with good medical care she should be able to get good relief and have a much better quality of life once the right path is found. I hope I have helped. This is a really difficult situation! Thank you so much for your prompt and thorough response! You've already provided more information for Sofie than the vets she's visited in the first 2.5 years of her life! We have decided that we can make a special dermatologist visit for Sofie and are hoping to be able to schedule an appointment in early November. Based on our location in north central WI (Phillips, WI), can you make a recommendation on what dermatology facility I should contact? I've heard mention of universities in both Minneapolis, MN and Madison, WI. My dad lives in the Chicagoland area and I'm sure there's options down there, too. At this stage, I want to be sure we contact the BEST possible specialist for her condition because I don't think she can stand another three months of pain (and we do have to consider that we can only take so much time off work before we run out of vacation days). Do you feel that a university facility would be her best bet or should I spend time seeking out a veterinary dermatologist specialist in private practice? Can you recommend any dermatologists specifically? A question about lupus (SLE not DLE since DLE states that symptoms usually show on the face and nose): One of the symptoms of SLE is a fever that is unwavering even when antibiotics are administered. Looking through vet records, Sofie has never had a fever and her temperature readings haven't changed (gone down or up) even when she was started on a course of antibiotics. Have you heard of a dog with lupus that never had a fever? If her vasculitis is the result of a drug reaction, it should be noted that Sofie received a whole host of vaccines in February 2014 all on the same day: 3 year rabies along with her DA2PP + LGP annual vaccines, bordatella, and a lyme disease shot. I suppose it could also be from one of the antibiotics or steroids she's been given more recently. 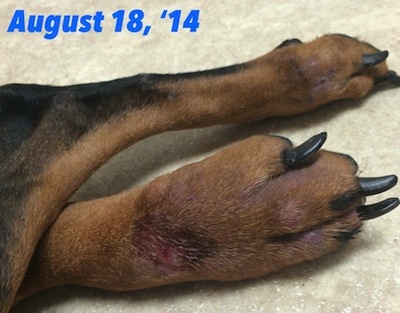 If her vasculitis is the result of her skin reacting to staphylococcus, it should also be noted that in a vet visit in July 2013 that a pathologist report for antibiotic susceptibility noted a "growth of large number of Staph aureus (non-meth resist) and low number of enterobacter." Cytology and biopsies this year haven't noted any staph bacteria. As for tick-borne illness, our most recent vet did mention that as a possibility and she has been bitten by ticks on numerous occasions. Being in the northwoods of WI, we definitely are surrounded by ticks and do our best to check our dogs and remove them ASAP. However, those tiny deer ticks are about as big as a grain of sand and I'm sure sometimes they slip through unnoticed. If she's ultra-sensitive to tick bites and perhaps tick bites are what start this whole ordeal, I hate to say it but there's no getting away from ticks up here, at least that I know of. If she turns out to be a special needs dog that can't be around ticks, for her own health, she can't live in northern Wisconsin. Now, if she already has a tick-borne disease from a previous bite that's caused vasculitis, we can do our best to treat that. Thank you again for your thoughts and advice. You're very welcome and I'm glad that I can help. In regards to dermatologists, I would go on the recommendation of your vet. But really, any veterinary dermatologist really should be good. These vets have spent several years beyond their veterinary degree studying only skin issues. I am not personally familiar with any in your area though. To me, lupus seems unlikely. I do think that you would have seen something on the biopsy that would have pointed towards lupus if this were the case. I'm guessing that you'll never know the cause of the vasculitis unfortunately.